Serious collectors of Civil War era flags are usually very specific about American history, and look for certain types of flags to complete their collection. Many will focus on either the Union or the Confederacy flags, but a Civil War historian often has a complete collection of both. This article focuses on the Union flags from the Civil War era. 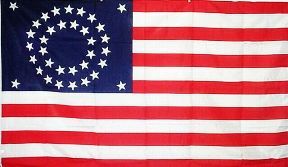 A Fort Sumter flag that flew during the Confederate bombardment in 1861 is similar to the 33-star flag except the stars were shown in a different pattern. The flag flown over General Custer’s headquarters was half blue and half white, with two white swords crossed over it. Starting a collection of Civil War flags is a great way to track the various battles and important events of this era of national turmoil. Many history buffs and Civil War historians collect small framed flags from a variety of sources, but the number of authentic flags is very limited. Replica flags are a much more affordable way to complete a collection, and can be used during reenactments. Shopping at a U.S. flag store for replicas is a great way to fill gaps in a Civil War flag collection. The Advertising Flag Company sells a wide variety of flags since 1936, and our online Flag Store offers a huge selection of affordable flags, banners, flagpoles and accessories.